29-Aug-2016 -- This is a remarkable confluence point. If measured by distance to the nearest human settlement, this point must be one of the most remote in Nevada, if not the entire lower 48 United States. But, coincidentally, it lies precisely on a dirt road that passes through this remote desert region. Despite this, I was quite apprehensive about visiting this point, because I was worried about whether I would be able to drive there in my (relatively low-clearance) SUV, and what I would do if I broke down and needed help. 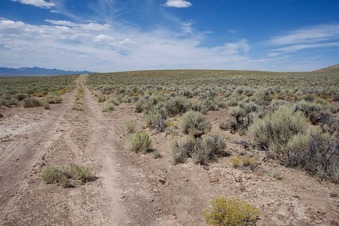 There are basically three possible ways to reach this point: (1) from the north (from highway US-50) (this is the approach that Shawn Fleming took); (2) from the south (from US-6, near the “Lunar Crater National Natural Landmark”); and (3) from the southeast and south (from US-6 and Nevada-379, via the Duckwater Indian Reservation). Driving from the town of Ely, I chose option (3), because I figured this would minimize the amount of driving that I’d have to do on the most minor dirt roads (those marked with the thinnest lines on my Nevada Road Atlas). From Ely, I drove south on US-6, then (at the almost-ghost town of Currant) turned right onto Nevada Highway 379. This took me to the Duckwater Indian Reservation - a hardscrabble, impoverished-looking settlement. I then took a series of dirt roads heading westward through the Pancake Range into the Little Smoky Valley, then finally onto the long dirt road that runs roughly south-north through the point. My GPS receiver located the point on the eastern edge of this dirt road.